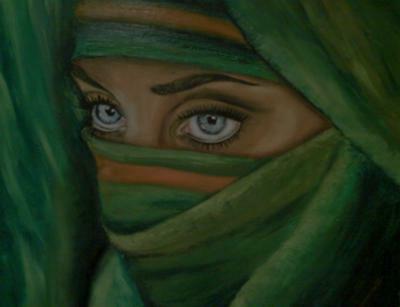 Hi I have done this painting of "Girl Wearing Hijab" on a "16 x 20" inches canvas, using oils as my medium. I first sketched the subject on my canvas using charcoal, and blended in the base colors with a thin mixture of oils, basically using olive green for the exposed area of the face and dark blue and green for the background and head piece. When that was dry I started painting from left to right firstly using a shade of burgandy, mixing scarlet red and ultramarine blue. I painted the head piece using a mixture of viridian,emerald green, yellow ochre, orange and some yellow. The skin tone on the face was done mixing together some burnt sienna, yellow ochre, and zinc titanjum white. The darker areas I used some burnt umber. I gently blended the colors with a nylon flat brush and in some areas I just used my finger. The eyes were done in white, ultramarine blue, pinch of burnt umber, and black. I love the way you rendered this painting. Her eyes are beautiful done and capture the attention of the viewer. Thank you for sharing your painting with all of us. Looking forward in seeing more paintings from you. yeah i like it dude\.. i love your work weeeeew.. hehehhehe. This painting is 2" x 4" feet in size, Acrylics & Oils incorporated on Canvas. It took me almost a week to complete this painting. Mixing the colors for the bark of the tree was a bit challenging as I used alot of raw oils on this area. Sometimes I would put a speck of too much black to make my greys and ended up having to wash away that mixture, and start mixing a new shade. But I managed to get it right and finished the bark in two days. 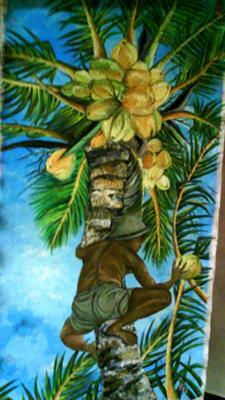 The Coconut Leaves stalk was done in oils and when it dried, I worked in the green and black forming each blade of leaf some overlapping the other. Lastly I did the man. He was an interesting subject, I mixed some dull red, yellow, black, white, on my pallet and began painting him. when I was finished I used a pinch of ochre here and there to highlight his skin tone a bit more. I am happy with my finished product, all I have to do now is get a frame for it. I recently visited the 'Wild Fowl Trust' located in Pointe-A-Pierre, Trinidad and was blown away by the lush green plantlife, bird, and especially the lillies. So I decided to take the task of capturing them not only with my camera but also on my canvas using oils. I walked with my stretched canvas paper already prepared with layers of gesso. I found a suitable spot and set up my easel, quickly I sketched in my water lillies using a charcoal stick and blended in the colors with my fast drying acrylics. Using shades of greens: lemon, emerald and virdian. I used some ultramarine blue also for darker areas and some black and brown for the background. The rain was about to pour down so I quickly gathered my stuff and packed them into the trunk of the car and left for home. Later that evening I went back to work on my lillies, blending in my oil paints to match the colors of my acrylics and moved down the painting....The flowers were painted last I used some chineese white and crimson for the bright areas and some dark brown and burnt sienna for the dark areas. It took me about four hours to complete, I just couldn't stop painting so I finished the entire painting that same evening and left to dry. They are truly beautiful! 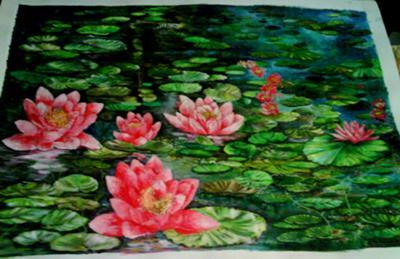 I love the bright colors of greens against the your water lilies. Thank you for sharing your painting with all of us. 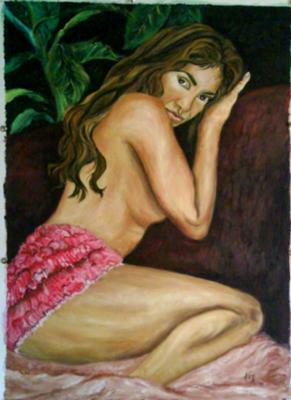 This painting was completed yesterday 25th of May 2011. It took me four days to put together. I first stretched my paper on a flat piece of ply wood, tacked the edges and applied two coats of gesso to my paper. When it was dry I sketched in my subject on the sofa and the background leaves. I mixed in my palette some olive green oils and applied that to the subject leaving to dry for one day. I painted in the background using shades of greens, yellows and a pinch of orange, I also incorporated in some shades of browns and black. The following day I started painting my subject starting from the hair using a mixture of burnt umber and raw sienna also a pinch of black, while holding my flat bristle brush in an upright position I gently made strokes forming the curls down her shoulder. I mixed in some burnt sienna, raw sienna, and burnt umber to get the color of her skin. For the lighter shades I mixed in some white to the burnt sienna and raw sienna. For her lips I used crimson and white and a shade of the burnt sienna.